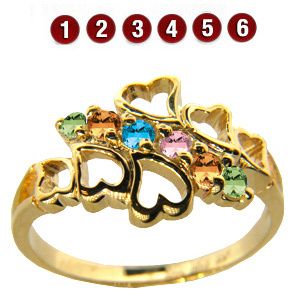 The 14k yellow gold family hearts mother's ring is set with six round genuine birthstones. Select a birthstone for each member of your family. Each stone is 2.5mm in diameter. Made by ArtCarved. Import. Order by April 28 for Mother's Day. This item ships to the United States, Canada, Australia, United Kingdom and Germany.